On January 22 tickets go on sale for Normal CornBelters’ 3rd Annual Legends Game. Last year’s event sported a lineup that included former St. Louis Cardinals pitcher/outfielder Rick Ankiel, former WWE United States Champion, Ron “R-Truth” Killings, ex-Chicago Cubs infielder, Mike Fontenot, and ex-Philadelphia Phillies closer, Mitch “Wild Thing” Williams. Jim Edmonds; Edmonds is a four-time All-Star (1995, 2000, 2003, 2005), eight-time Gold Glove Award winner and 2006 World Series champion. Known as one of the most revered center fielders of his time, his home run in the 2004 NLCS will go down in history as iconic. Over 17 MLB seasons, Jimmy Baseball compiled 393 home runs, 1,949 hits with a .284 career average and .903 OPS. Edmonds has also been inducted into the St. Louis Cardinals Hall of Fame. Ray Lankford: 13 of Lankford’s 15 MLB seasons were spent in a Cardinals uniform. He possessed that rare combination of speed (258 stolen bases), power (238 home runs) and is the only Cardinal in their storied history to boast that 200/200 split. 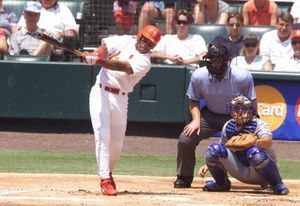 Fernando Tatis: Tatis, the most recent addition to the game, rewrote the record books on April 23, 1999, when he hit two grand slams in the same inning off of Chan Ho Park. His time in St. Louis was short (1998-2000), but put up career numbers in 1999 in average (.298), home runs (34), and RBI (107). Over his 11 year career, he also spent time with the New York Mets, Montreal Expos, Texas Rangers, and Baltimore Orioles.